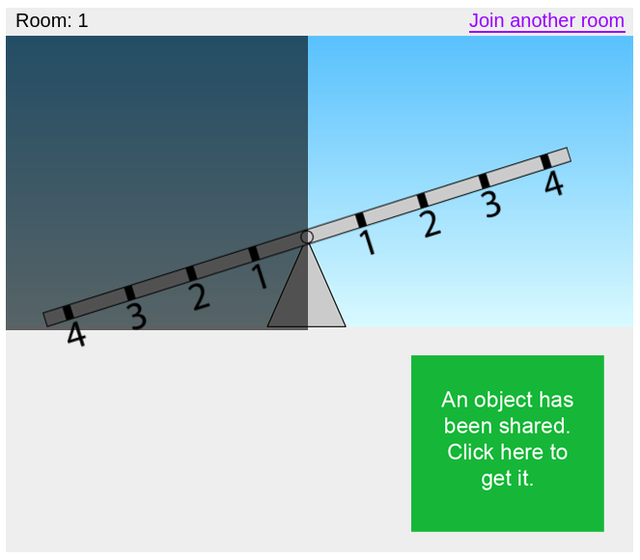 Can you make the seesaw balance using only 1 object? If yes, then describe exactly how you made the seesaw balance. (This question can be also asked for 2, 3, or 4 objects. 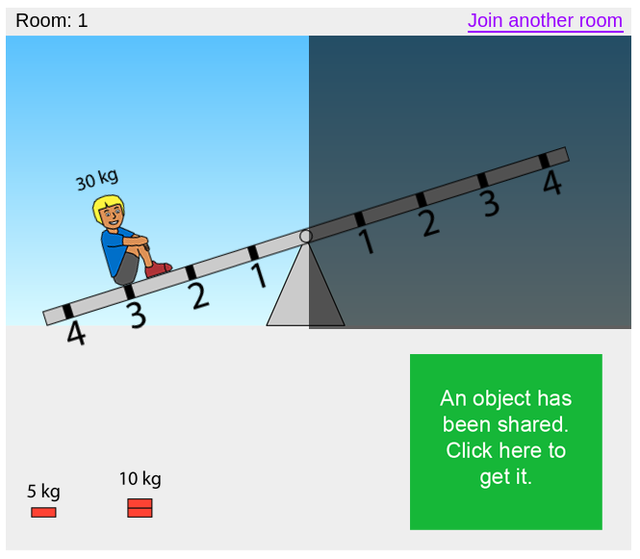 Note that you can never balance the seesaw with only one object on the seesaw). Can you guess which objects and what positions your fellow student is placing their objects? 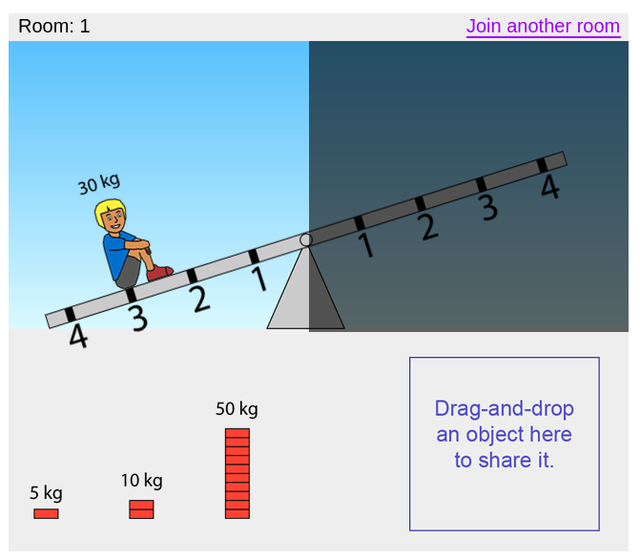 After using the Collaborative Seesaw Lab to foster collaborative skills, it is recommended that students proceed to develop their knowledge and investigate the physics of the seesaw situation. A very good lab for this objective is the Balancing Act Lab. You can also add a second investigation phase to your ILS to include an additional lab. 1.) When you click on the "Create Space" button you will create an ILS that has two versions of the Seesaw Lab in the investigation phase. The version called "Seesaw Lab - left side" will only allow a user to interact with the left side of the seesaw. By default, all objects initially appear in this version. The version called "Seesaw Lab - right side only" only allows a user to interact with the right side of the seesaw. 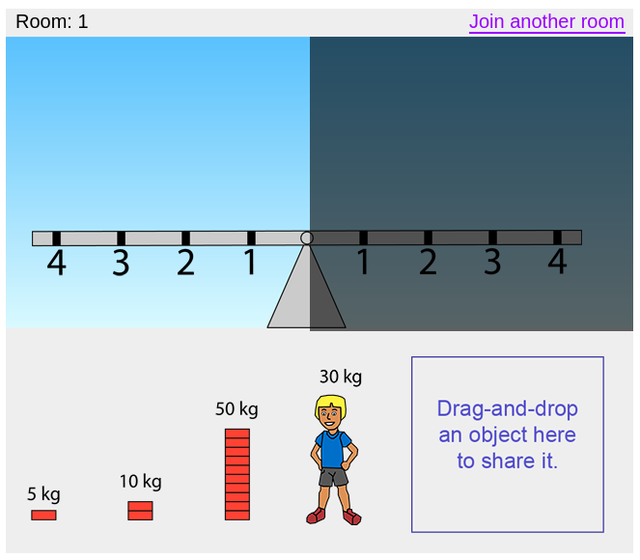 By default, no objects appear in the right side version and students using the left side version, where all the objects are initially located, must share objects to students using the right side version of the Seesaw Lab. 2.) Because two version of the Seesaw Lab are created you should delete one of them and rename your ILS appropriately (e.g., Seesaw Lab - left side). Then return to the Seesaw Lab page at Golabz and click the button "Create Space" again. This will create a new ILS with the two versions of the Seesaw Lab. Simply delete the version of the lab for which you already have an ILS of and rename the new ILS appropriately (e.g., Seesaw Lab - right side). 3.) The Seesaw Lab is meant to be used together with a chat application, such as the SpeakUP app, so that students can communicate with each other. Include the SpeakUP app preferably right before the lab. To use the SpeakUP app students are required to enter a common room number or create a room and share the number of the room with the other student(s). As a teacher you can also create multiple room numbers using the SpeakUP app and assign them to students as you like. This will allow you to access their chat transcripts later to read how they communicated with each other. 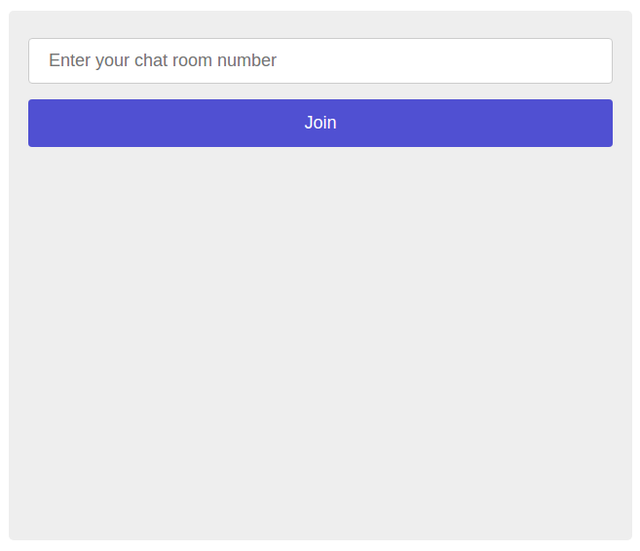 The Seesaw Lab starts by asking users to enter a chat room number (which users of the SpeakUP already have). 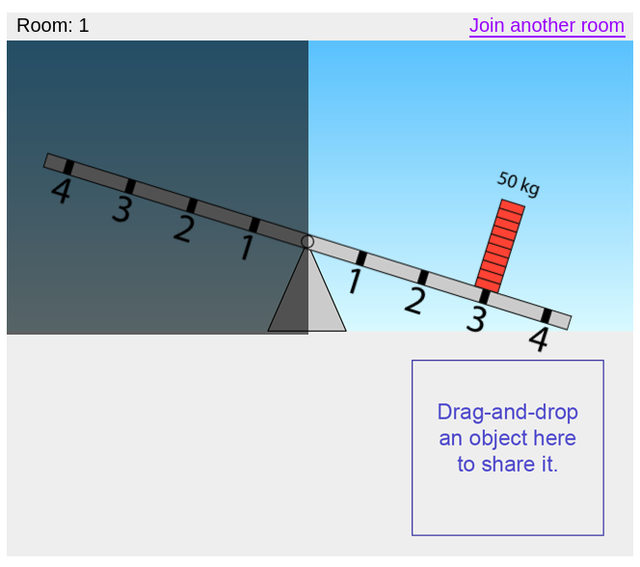 As long as two users enter the same room number they will then share the same seesaw with each of them in control over one side of the seesaw. Please instruct your students in the ILS that they will not see the lab without a chat room number. 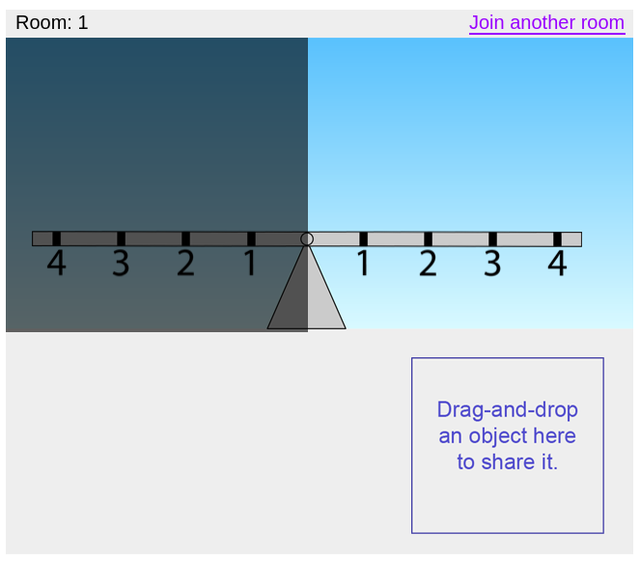 This lab was inspired by the Balancing Act Lab developed by the PhET interactive simulations project (https://phet.colorado.edu/), as well as by the Balance Beam task developed by the Assessment & Teaching of 21st Century Skills project (http://www.atc21s.org/).